As is the case every major holiday, the struggle to sort out how to visit both of our extended families began about a month before Christmas. This year proved to be less simple than years past, because while we both wanted to visit our families, we also kinda wanted to have Christmas time to ourselves, with it being our first. Most of the ideas to solve this dilemma involved too much stress (and gasoline) than our minds and bodies would be able to handle (driving from Rome to Marietta on the Eve of Christmas Eve… going to the Christmas Eve celebration at my grandmothers house in Woodstock the next day… then driving back to Rome that night to spend Christmas morning together alone the following morning… only to try to make it all the way to Macon by lunch time!). Not to mention Christmas fell on a Sunday that year, which brought church attendance into the equation! It was somewhere during that whole deal when one of us (I want to say it was me, but I cannot be sure =P) thought of the brilliant idea of spending the weekend before Christmas in a cabin in Tennessee, celebrating Christmas together there instead of Christmas morning. I have to admit, being too much of a sentimentalist made this hard, but after I let go of religiously and emotionally HAVING to celebrate Christmas on Christmas Day, it became the funnest Christmas idea ever! 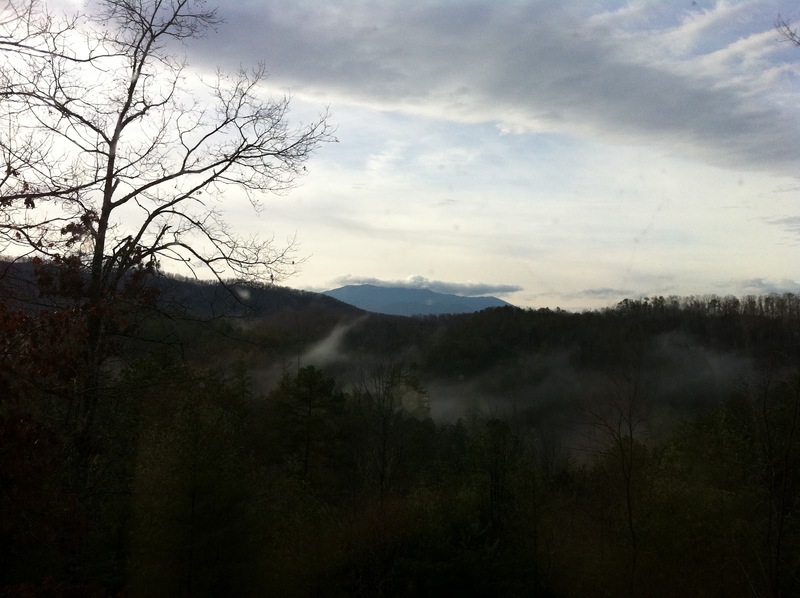 This was our view from our cabin in the Great Smoky Mountains! I find that I’m more of a mountain person than a beach person. There is nothing like enjoying a view like this, and experiencing God’s beautiful design in creation. The Great Smokies are a personal favorite of mine, having visited multiple times during my youth (not to mention my honeymoon!). Kaitlin always gets a kick out of me never leaving out the “Great” in Great Smoky Mountains. 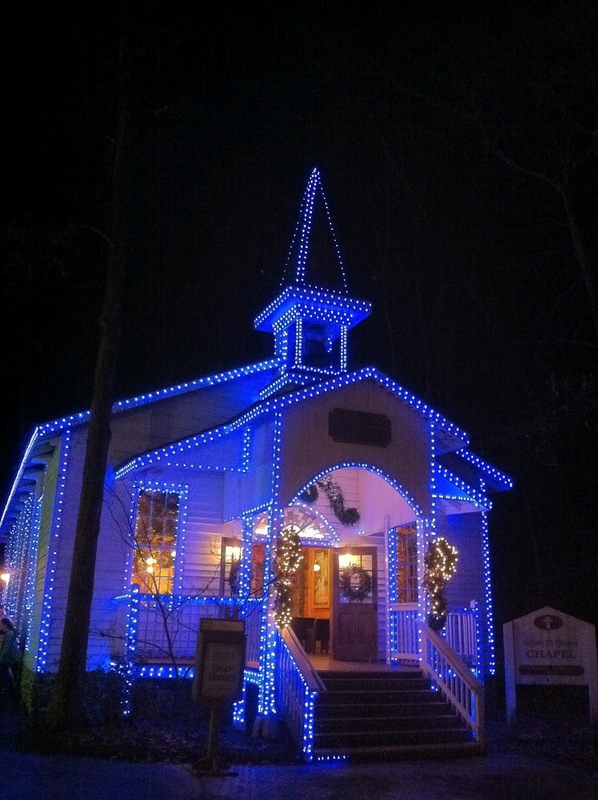 It turned out to be a fairly cheap and endlessly fun Gatlinburg getaway Christmas, mostly spent at Dollywood (with rain checks from the time we went during our Honeymoon and it closed because of a storm), eating, and shopping. If I remember correctly, it’s Kaitlin’s favorite part of the park. 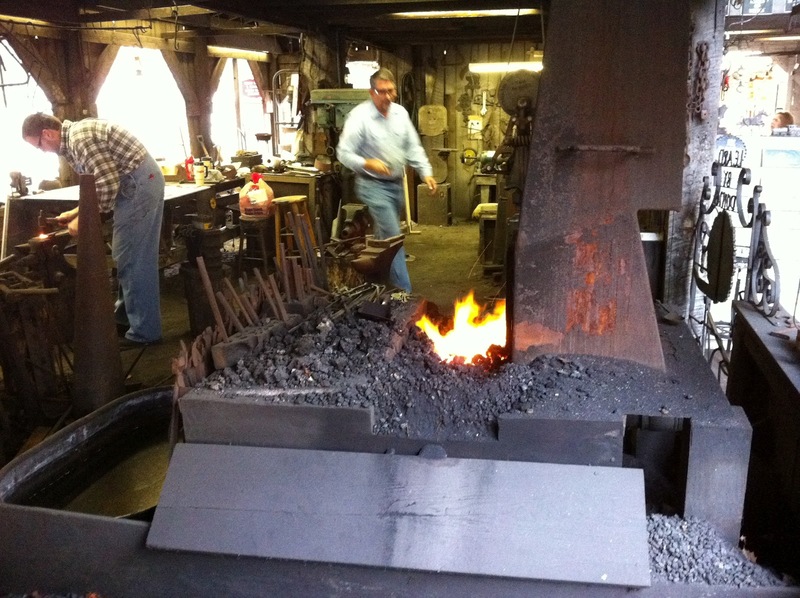 We spent at least half an hour watching the blacksmith work his magic with the fire (and knocked out some people on our Christmas gift list too!). …and the Smoky Mountain Pancake House. If you happen to have ever driven all the way to this part of Tennessee and did not come across these fine eating establishments, you seriously missed out to say the least. Arrive hungry and order what you want, because it is going to be one of the best dining experience your mouth has ever encountered, hands down. 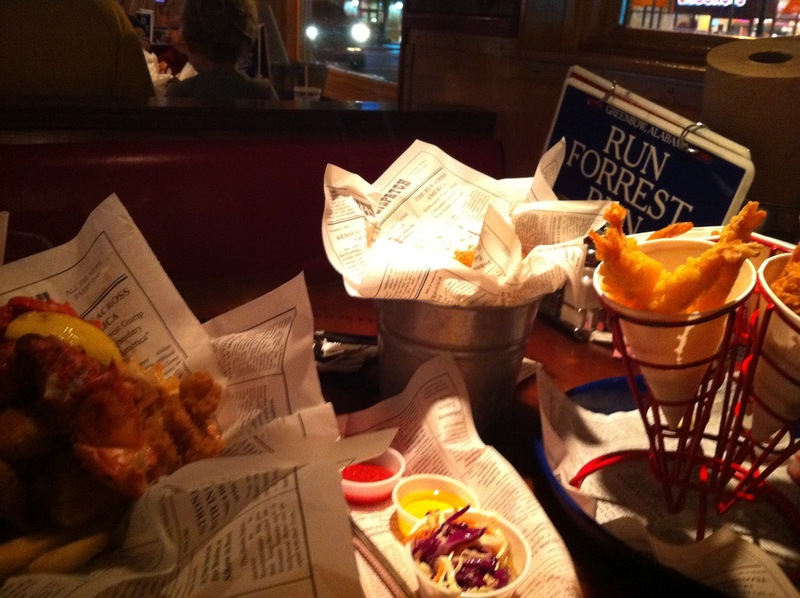 If you go to Bubba Gump, freshen up your Forrest Gump trivia, because you will be tested! Also, go ahead and order the hush pups. Just do it. 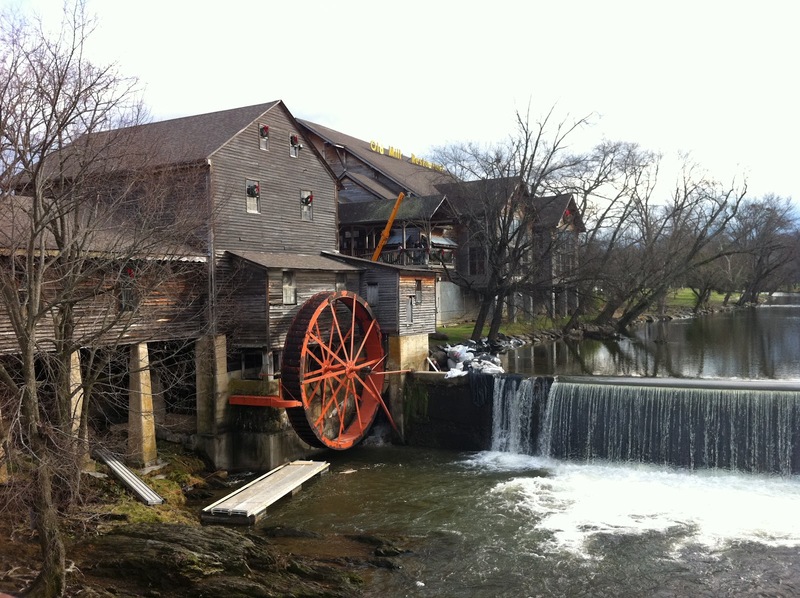 At the Old Mill, just about anything on the menu will be great, but make sure you order extra corn fritters. They are the best in the world! Seriously. What you see in the last picture is the Hungry Bear Breakfast! I recommend it. When we got back home, we still had a day to rest and prepare for all the traveling. We celebrated Christmas with my family at my grandmother’s (Nanny!) Christmas Eve party, and headed to Kaitlin’s house to celebrate with her family on Christmas Day. All in all, it was such a peaceful and fun alternative to running around across the state that week. Who really wants to get stressed out during Christmas? It’s hard to avoid it, but should we really celebrate the birth of our Savior by stressing out, running around like chickens with our heads cut off, buying people things they don’t need just because it’s what we’re supposed to do, etc. I’m not trying to be a Grinch at all here; Christmas is actually one of my favorite times of the year, and I don’t have anything against buying Christmas presents (I bought Kaitlin a new study bible and a barn coat, and she bought me an iPhone (which produced all the pictures in this post!). I just think that anything that can be done to make Christmas more of a joyous celebration and peaceful fellowship with family should be wholly pursued, and we had such a great time pursuing it this year. 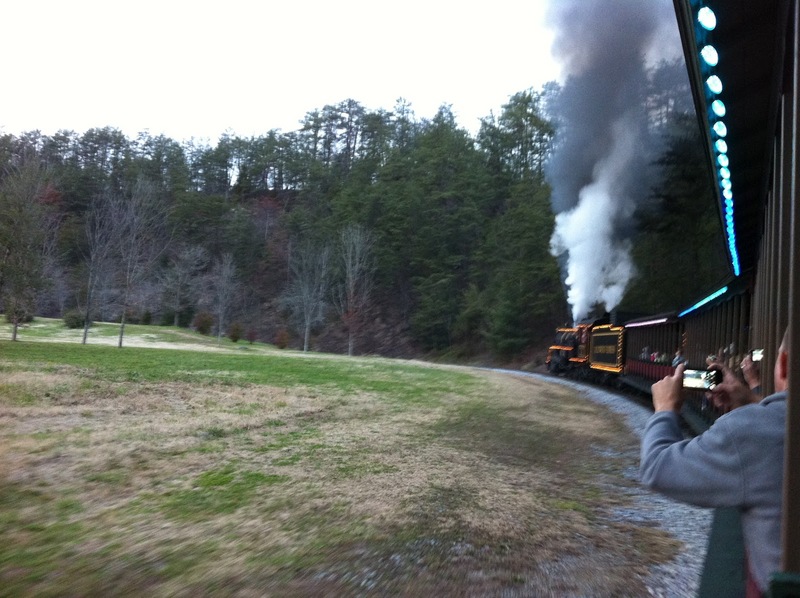 Such a great time, that Christmas in the Smokies may become our first family tradition. =] Well just have to see.